On August 13, 2010 Melvin Catterton, a retired Anne Arundel police officer living in Annapolis, was surprised to find a letter marked “Police Department Notice” from the Brentwood Police in his mailbox. He was even more surprised to open the envelope and see that this was a speed camera citation. Why? Because he had never been in Brentwood. According to Catterton, his car is a Mercury Marquis SED plate number FOP-1023. The vehicle in the image was a 2000 C Class Mercedes with a blurred tag number. Catterton took the image to an optometrist who used her magnifying equipment and read the tag number “1823”. The citation (#8w101654820) was signed by Brentwood Police chief David Risik. Catterton called Risik and confronted him about the matter. Among other things, he questioned why a citation was issued if the tag # was blurred , and whether Risik merely “rubber stamped” every citation without comparing the citation vehicle with the M.V.A vehicle description. Catterton wrote a letter the Brentwood's mayor and council dated August 24th expressing his frustration with the situation. He was so angered with Risik’s attitude during the conversation that he went to a Brentwood town meeting the second Tuesday in September and confronted Mayor Montgomery-Wright about the matter. This is not the first concern which has been raised about Brentwood’s speed cameras. We have already documented that the speed limit on the portion of US Route 1 (Rhode Island Avenue) was lowered in April from 35mph to 25mph in the immediate vicinity of the speed cameras which were installed shortly thereafter (one camera is used by Brentwood, another by Mount Rainier). The Washington Examiner reported that the town’s contractor, Optotraffic, is investigating whether their cameras have inaccurately recorded the speeds of some large vehicles including buses. 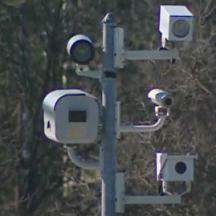 Brentwood was forced to institute a ‘speed camera amnesty program’ for citations issued between June 24 and July 13, 2010. Police Chief Risk apparently approved over 3500 citations during that period. However Risik’s contract with the town expired on June 24 and the council refused to renew it, and as such he was not legally a police officer at the time and not authorized to approve citations. After a new council member started her term in July a new contract was signed on July 19th (which we note is 6 days after the end of the amnesty period). Two council members, who opposed reinstating Risik, did not sign the new contract. The amnesty was at first offered to Brentwood residents and advertised only on a local blog, but the Gazette later reported in August that this had been extended to all ticket recipients. People who have gotten such citations have reported not receiving such a refund so far. A copy of this letter obtained by StopBigBrotherMD was dated August 23rd, meaning refunds should be paid before the end of November. In a Brentwood town council session, it was discussed that Brentwood would pay Optotraffic over $50,000 to pay for the refunds, to cover both the town’s portion and the contractor’s portion of each citation.